There’s plenty of space for the whole family in the charming Family Suites. 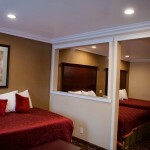 Each room has two separate rooms inside of it, one with 2 beds, and one with 1 bed. These modern rooms boast colorful décor, sleeping accommodations for six, two flat screen TVs, and much more. Perfect for the family with parents that need privacy at night.